Crista Worthy is a contributor to Writers on the Range, the opinion service of High Country News. She writes and flies planes in Idaho. I live in Idaho, which hardly has a reputation as a “liberal” state. But we Idahoans know how to protect our natural resources for the long haul. We are proud to say that we have the largest contiguous federal wilderness area in the Lower 48, the Frank Church River of No Return Wilderness. We’re proud of Craters of the Moon National Monument, too. Our natural areas are where we go to ease our souls from the stresses of the modern world. Now, we have a new Interior secretary. Though he has only held the position for a few months, he has made it clear that his aim is not to protect our national treasure of national monuments, but to harm them. Pandering to a few extremists who wanted to curtail Bears Ears National Monument, he traveled to Utah, saying he wanted to “hear both sides.” Yet Ryan Zinke spent scant moments listening to Native Americans with deep roots in the area, recreationists, and many other supporters of the monument. Instead, he breezed through Bears Ears and Cedar Mesa accompanied by the Utah governor and his oil and gas industry allies, before heading over to Grand Staircase-Escalante National Monument. 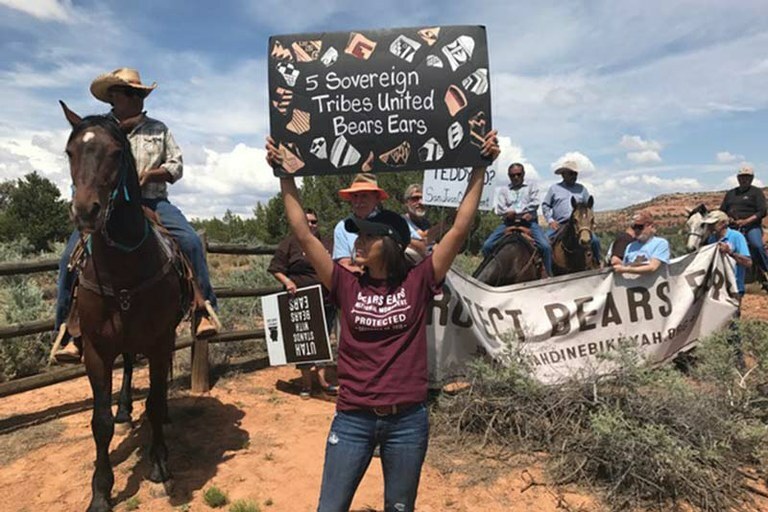 Diné Bikéyah volunteers and other activists hold up signs in support of Bears Ears during Zinke's San Juan County visit. Though Zinke might not be listening, many Americans have spoken up in defense of Bears Ears and the other national monuments now under “review.” Americans only had 15 days to comment on Bears Ears. Yet when the nonprofit Center for Western Priorities, a nonpartisan conservation organization based in Colorado, analyzed a representative sample of the more than 90,000 comments submitted by May 25 (the day before the comment period ended), it found that 96 percent of them expressed support for national monument designations, and only 3 percent expressed opposition. About half (48.4 percent) of the comments referred specifically to Bears Ears National Monument and expressed a similar 97-to-3 ratio of support. In addition to the 90,000 individual comments as of May 25, dozens of groups like the Sierra Club and Southern Utah Wilderness Alliance gathered feedback, which amounted to over 685,000 additional public comments in support of Bears Ears, and tens of thousands of comments in support of other national monuments. Unfortunately, each of those bundles, submitted by each group, will only count as one comment when uploaded to regulations.gov. But when combined they show support for Bears Ears and other national monuments at more than 99 percent, all gathered during this short 15-day comment period. That’s an overwhelming majority, if you ask me — better even than Donald Trump’s ratings on The Apprentice. Yet Zinke ignored the public outpouring. Instead, he announced that he wishes to dramatically shrink the monument. He then opened the comment period again, until July 10. Once again, defenders of Bears Ears and other national monuments must stand up and be counted in opposition to this administration and the secretary of the Interior. If Zinke tries to play havoc with the Antiquities Act and shrink our monuments, he’ll need Congress to approve it, and members of Congress will need our support to stand up to him. If Congress is flooded with calls that support leaving the monuments as they are, those elected officials are more likely to listen. We need to stay involved. Submit your comment to regulations.gov if you haven’t already (167,408 have been received as of press time). Let the Department of Interior know how you feel about Bears Ears. Next, open up a blank Word document on your computer, or pull out a clean sheet of paper. Find and then write or type the names, addresses, phone numbers and emails of both of your U.S. senators and your U.S. representative. You can also get the contact information for the Department of Interior. Pick up the phone and call, and then keep that paper handy in the kitchen or that document readily available on your desktop for future use. It’s time to open the floodgates of protest.